Northern Red Oaks at UVM. Stadlin, E. (2013). 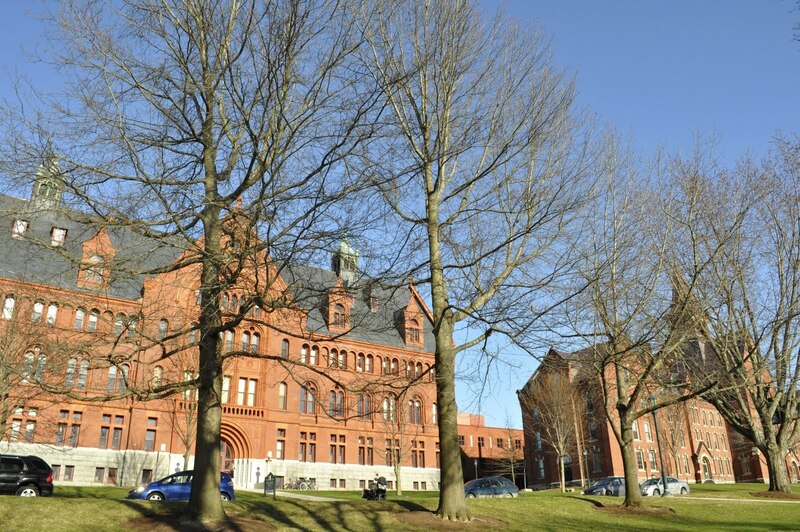 The Northern Red Oak can be found on UVM's own campus. Students find shelter from the sun under their leaves, providing many with a quiet place to do homework or read a book or practice silent meditation. Some have even tried to climb these trees, but the branches are too high up. One of the most notable Northern Red Oaks is on the Waterman Green. This setting makes sense. As a large mature tree, the Northern Red Oak is prominent and enhances the beauty and prestigue of the campus. Also, the Northern Red Oak is extremely adaptable, remaining hardy in the hard Vermont winters. It is a symbol of preserverance. Students can enjoy this tree throughout the year for it adds its own unique character to the campus environment.